William Theophilus Ross was born in Ashmore, Dorset (about five miles southeast of Shaftesbury) at the beginning of 1888 and baptised there on 4 March 1888. He was the son of farrier Edwin Ross (1868-1938) originally from Shaftesbury and Sarah Susanna Minnie née Davey (b1860), originally from Banningham, Norfolk. In fact William never lived in Yeovil - his family moved to London the year after his birth, moving to Huish, Yeovil around 1910 by which time William was a cook in the army and stationed in Malta. After his army service he lived in Mitcham, Surrey. Nevertheless, since his parents had his name inscribed on the War Memorial in the Borough, I have created this page to commemorate William Ross. From 1889 the family lived in Islington, then Camberwell and finally Lambeth, all in London, where William's siblings were born; Edwin (1889-1902), Reginald James (1897-1974), Lily (b1900) and Margaret May (1901-1986). William became a professional soldier, serving in No 5 Company, Royal Garrison Artillery. In the 1911 census, at the age of 24, he was stationed in Malta and he gave his trade as a cook. After leaving the army William served in the Metropolitan Police and was a National Reservist. In the summer of 1913 William married Daisy Lily Sibley at Hackney, Middlesex and at the outbreak of war they were living in Mitcham, Surrey As a married National Reservist, William was not called up until late 1915. He rejoined the Royal Garrison Artillery, serving in the 32nd Trench Mortar Battery. His Service Number was 22665. After a period of training in Scotland, he was sent to France in January 1916. His previous military career clearly counting, William had the rank of Sergeant. It is nearly impossible to discover where William fought, however since he was buried at Cambrin, France, it is clear that he was involved in the trench fighting to the east of Bethune and north of the main Somme battlefields. 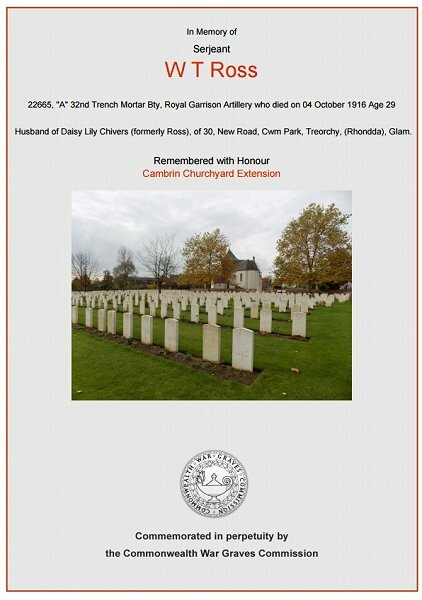 Nevertheless Cambrin, just north of Loos, was part of the whole Somme Offensive. 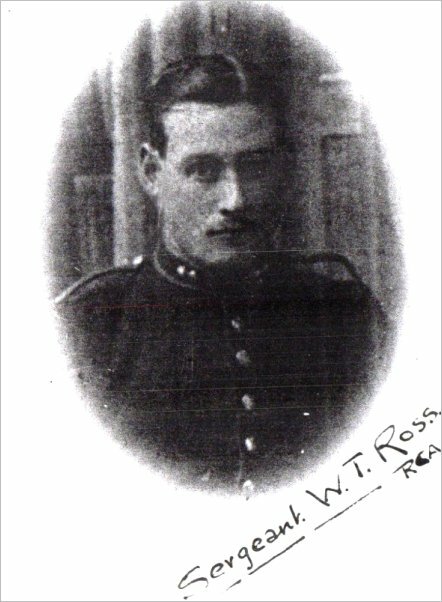 William Ross was killed on 4 October 1916 by a bomb from a German minenwerfer (trench mortar), aged 29. 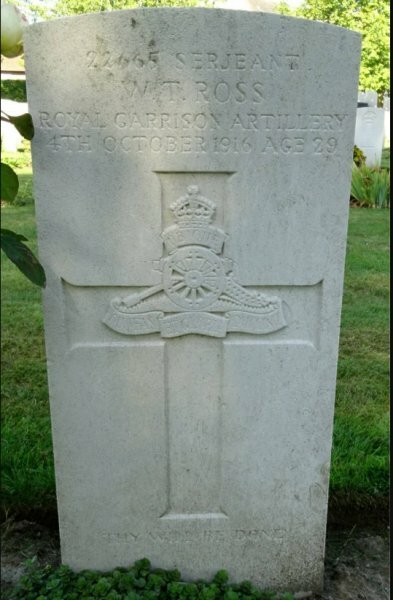 He was interred in Cambrin Churchyard Extension, Pas de Calais, France - Grave S2. Even though he never lived in or near Yeovil his name is on the Yeovil War Memorial in the Borough. The Commonwealth War Graves Commission certificate in memory of William Ross.